Good to know: When you want to join one of our 49 associated sports clubs you have to buy a either a full membership of the ACLO (€59,95) or a Semester Card(€49,95), dependent on when and how long you are planning to sport at one of the associations. The sports clubs ask for a membership fee. The amount of the fees differs between the sports clubs. From Monday the 13th of August 2018 you can buy the ACLO Card for the academic year 2018-2019. 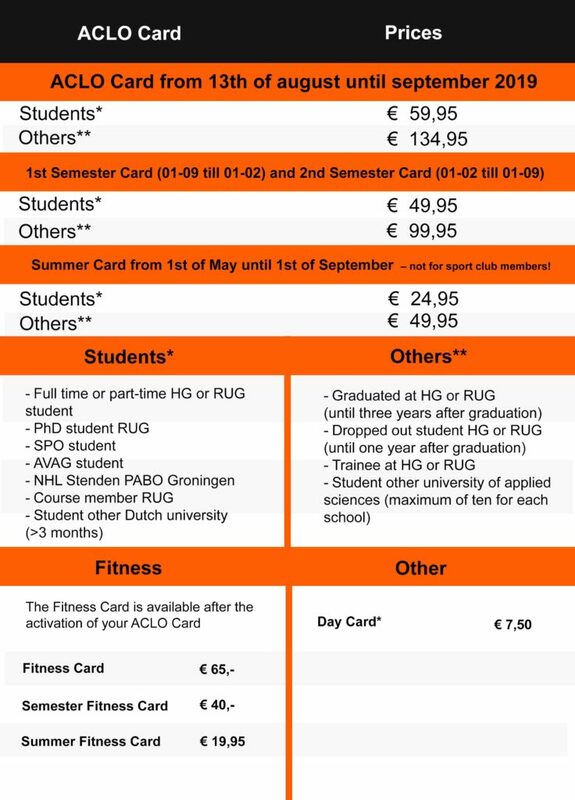 The ACLO card costs €59,95 and gives you the possibility to sport unlimited for the entire college year. Do you want to use the fitness (gym) as well? Then you can buy a Fitness card from the 14th of August 2017 for €65,- extra. You should have a valid ACLO Card before you can join the fitness. For more information about the fitness click here. The ACLO has different prices for different groups. See in the column on the left if and in which category you can buy your ACLO Card. Throughout the year you can purchase an ACLO Card. The validity of this is always per academic year, so from September 1st to September 1st, regardless of when you purchase your ACLO Card. Want to know what the ACLO is like? Buy the ACLO Day Card for €7,50 and try out all different sports! The Day Card is for students only. A studentcard of the RUG- or HG is your ACLO Card and also your entrance card for the ACLO Sports Center. An ACLO Card is strictly personal.